RCP Block & Brick provides a selection of valuable details, pre-engineered drawings, and supporting information for the design and construction of Keystone Segmental Retaining Wall Systems (SRW). For more information or for any questions, please contact RCP Block & Brick Keystone Support. 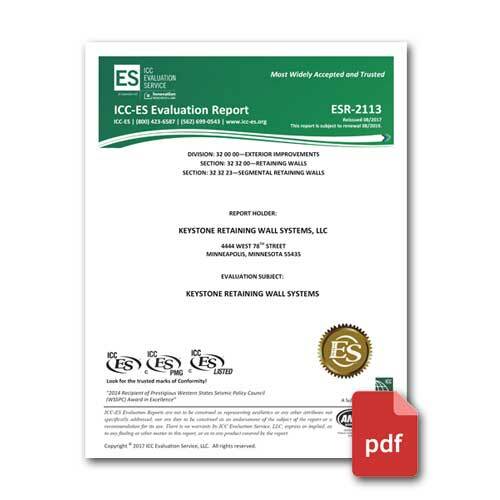 ICC-ES evaluation on the Keystone segmental retaining wall systems. Product covered include Standard II, Compac II, and Country Manor. 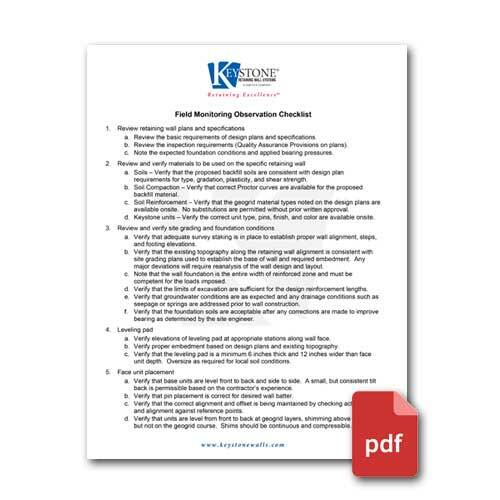 Checklist for monitoring and observing the construction of Keystone segmental retaining walls. Engineered and approved design manuals for a variety of Keystone retaining wall styles up to 6' in height. NOTE: Engineering is specific to the Southern California region. 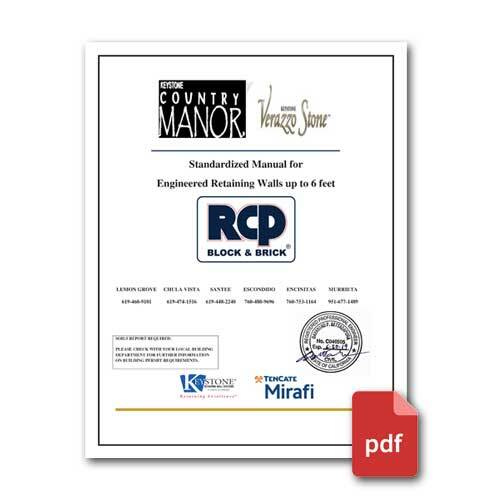 To reduce liability of manuals being used in other areas of the country, these manuals are available only by visiting an RCP Block & Brick location or by contacting the RCP Keystone Support team. 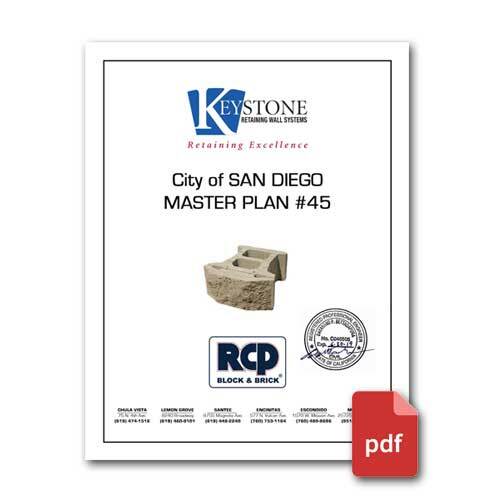 General notes, step-by-step worksheet, estimating worksheet for the construction of Keystone retaining wall systems in the City of San Diego. Call for more information. Standardized Manual for engineered Keystone Country Manor and Verazzo 4-Face Retaining Wall Systems up to 6' in height. Call for more information. 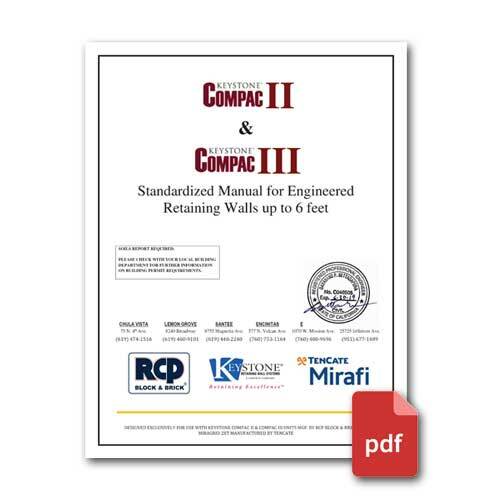 Standardized Manual for engineered Keystone Compac II and Compac III Retaining Wall Systems up to 6' in height. Call for more information. 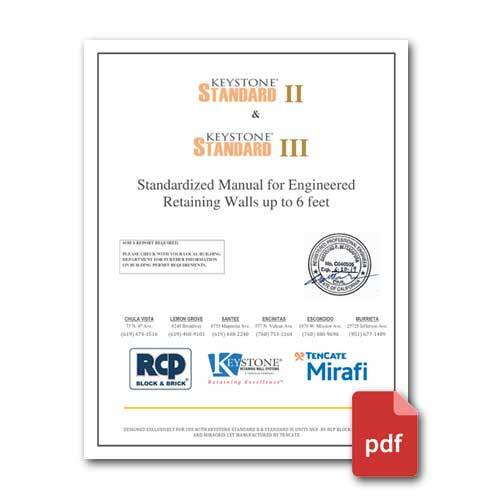 Standardized Manual for engineered Keystone Standard II and Standard III Retaining Wall Systems up to 6' in height. Call for more information.